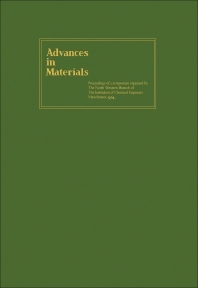 Advances in Materials surveys the developments in materials science and technology. This book examines the limitations imposed by materials on the development of technology. Organized into 34 chapters, this book begins with an overview of the techniques in solving the technical challenge in the field of materials. This text then defines the difficult environments considered in this investigation, which include mechanical stress, erosion, chemical attack, and thermal shock at temperatures above about 1200°C. Other chapters consider the successful development of nuclear thermionic converters, which centers heavily on the development of materials capable of enduring rather difficult working conditions for longer periods of time. This book discusses as well the techniques, such as the planar and epitaxy technique, employed in the production of devices. The final chapter deals with the rate of development in the equipment used in the fabrication of plastics. This book is a valuable resource for polymer scientists, materials scientists, engineers, and metallurgists.